What is the role of genetics in endometriosis? Whether it is believed to be the sole component or a contributing factor, many scientists agree that there is a genetic component to the cause of endometriosis. Studies have attempted to define the role genes play in the development of endometriosis. The medical community will know more about the disease and find news way to diagnose and treat it by better understanding the role genetics and genomics play in the underlying cause of endometriosis. When discussing the genetic component of diseases such as endometriosis, it is important to make a distinction between genetic and genomic studies. It is incorrect to use these two terms interchangeably as many do. While the term genetics refers to the study of single genes, genomics comprises the entire human genome (all of an individual’s genes). However, in the cases at hand, the distinction to be made is in the purpose of each study. 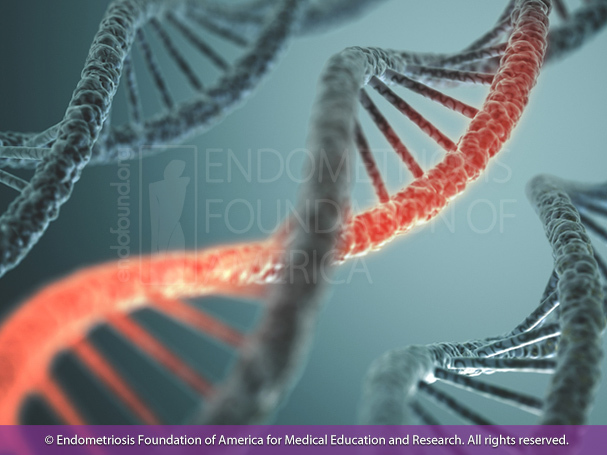 Genetic studies look to see if inheritance plays a role in endometriosis, whereas genomic studies look at how the genes related to endometriosis are expressed or activated. Nevertheless, both forms of research have been conducted within the endometriosis community and are of equal importance. What role does inheritance play in women developing endometriosis? Further studies have certainly pointed towards familial clustering being a component of endometriosis, however, the mechanism of this inheritance is not particularly clear. It has been proposed that endometriosis is a disease of multifactorial inheritance, meaning that it may not be determined strictly by a single gene, but rather a multitude of genes interacting together. In addition, environmental effects are also believed to play a role. Gene mapping in studying endometriosis? Gene mapping and linkage studies are one common way researchers identify the location of a particular gene and its distances from other genes of interest. This is of particular interest in genomic endometriosis studies as the activation of these genes, as well as their mutations, are suspected to play a role in the development of endometriosis. For example, one highly studied field pertaining to endometriosis is in the genes involving steroid synthesis. Endometriosis is a disease of menstruation and the chemicals that control this process are the steroid hormones estrogen and progesterone. For this reason, genes that regulate estrogen and progesterone receptors are of particular interest in gene mapping studies examining endometriosis. Some studies have found that progesterone resistance may play a role in endometriosis development. However, most of this research has ruled inconclusive to whether these genes are associated with endometriosis, and further study is needed. Investigation of methylation patterns in individual endometrial cells is one of the approaches for studying the activity of endometrial stem cells. DNA methylation is when methyl groups are added to DNA in order to signal a gene for activity or inactivity, without changing the DNA sequence itself. In other words, think of DNA methylation as a green versus red stoplight for the bodies release of stem cells. The study of this mechanism is continuously studied in terms of endometriosis. For example, one study found the extent of gene methylation in endometrial cells increased with age until menopause, and then remained relatively constant, indicating that the number of these methylation markers may have been a reflection of the mitotic activity of endometrial stem cells. This also goes to show how it can be possible for multiple factors to impact the development of endometriosis, as this study looks at the effect of both genomics and stem cell research. Keith A. Hansen and Kathleen M. Eyster: “Genetics and Genomics of Endometriosis.” Clinical Obstetrics and Gynecology, National Institute of Health. 2010 June; 53 (2): 403–412. Patel BG et al. : “Progesterone resistance in endometriosis: origins, consequences and interventions.” Acta Obstetrica et Gynecologica Scandinavica, Pubmed.gov. 2017 Jun; 96(6): 623-632. Taylor HS. et al. : “HOX gene expression is altered in the endometrium of women with endometriosis.” Human Reproduction, Pubmed.gov. 1999 May;14(5):1328-31. Kim JY, Tavaré, and Shibata D.: “Counting human somatic cell replications: methylation mirrors endometrial stem cell divisions.” Proceedings of the National Academy of Sciences, Pubmed.gov. 2005 Dec 6;102(49):17739-44.